Thanks to the generosity of our Dean’s Excellence Fund donors, the school awarded six students in academic year 2017-18. Funds were awarded to supplement expenses for high-impact learning opportunities such as study abroad, internship, and research travel. Students traveled to places such as Morocco, Spain, Cambodia, Vietnam, Argentina, and Ireland. 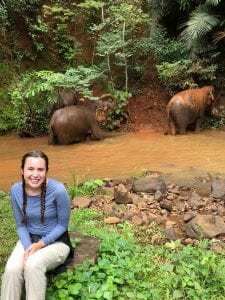 Delaney Wallace at the Elephant Valley Project in Cambodia. If you would like to make a donation to the School of Humanities and Social Sciences’ Dean’s Excellence Fund, visit hss.cofc.edu/giving.